Software developers have the best jobs in the country, according to a new analysis by U.S. News & World Report. To arrive at that conclusion, the magazine utilized a handful of measures: median salary, employment rate, 10-year growth volume (i.e., “the total number of new jobs that should be created for an occupation in a 10-year span”), 10-year growth percentage, future job prospects, stress level, and work-life balance. U.S. News & World Report suggests that software developers experience an “average” stress level, along with a high degree of work-life balance. That might come as a surprise to a certain subset of developers used to extreme stress and endless workdays—but it’s important to remember that not everyone builds software on a vicious schedule. In the magazine’s estimation, the specific factors that elevate software developer beyond other professions are the job market and prospects for future growth. It pegged the average salary for developers at $100,080, and the profession’s current unemployment rate at 1.6 percent, based off data from the U.S. Bureau of Labor Statistics (BLS). 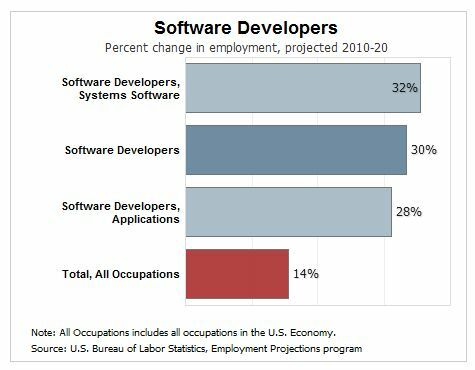 The BLS also estimates that the software-development industry will grow 30 percent between 2016 and 2026. In terms of the overall job rankings, software developers beat out dentists (in second place), physician assistants, nurse practitioners, and orthodontists to round out the top five. Healthcare-related professions dominated the upper echelons of the list, with tech jobs only popping up occasionally—information security analyst, for example, sits in 32nd place, while mechanical engineer is 34th. IT manager is 42nd. While things look great for software developers in general, those in the profession know that specializing in “hot” technologies produces the best chance of landing the biggest salaries and the most spectacular benefits. For example, those who work in machine learning and artificial intelligence (A.I.) can easily pull down six-figure salaries (or more) via well-monetized firms. But in order to make that kind of money, you need the right mix of skills and experience. I question both the average salary and unemployment rate. How did you calculate those values? How about lack of job security? What about agism in Software? 3/4 of a career is not a good situation to be in. I don’t get why there are always so many whiny divas complaining on these articles. I learned to program and switched careers to become a dev a few years ago. One of the best decisions of my life. My employers treat me with respect, I do have better work life balance and a more flexible schedule, the work is (finally) challenging, and my stress levels are the same. No, better, because I’m making way more money and not getting laid off every year. Do you guys who have always been in tech even know what “lack of job security” MEANS?